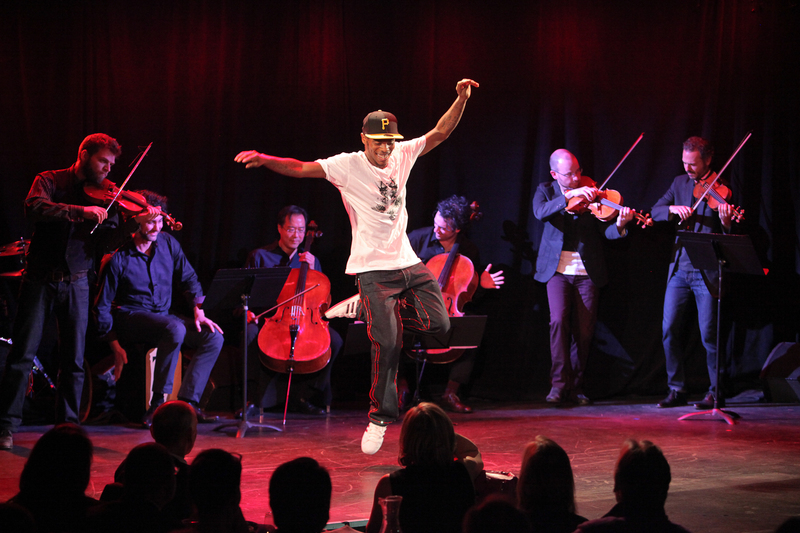 Lil Buck and the members of Brooklyn Rider and Yo Yo Ma at Le Poisson Rouge. Photo by Erin Baiano. It was a rather good week for dance in New York. For me, it began with Lil Buck’s lively evening of Jookin’ among friends, organized by the enterprising Damian Woetzel. Jookin is a kind of hip hop dance developed in Memphis, a descendent of the Gangsta Walk. It’s a surprising playful, fine-grained genre, full of slow turns, gliding walks, and, strangest of all, buoyant balances on point. Woetzel, who directs the Vail International Dance Festival and hosts a series of dance conversations at New York’s City Center (Studio 5), has become an energetic, and imaginative, advocate for dance in all its forms. The Lil Buck evening was held at Le Poisson Rouge, a nightclub-like space in the Village; the setting gave the proceedings a kind of edgy, fashionable feel. Owing in part to Lil Buck’s pop credentials—he has toured with Madonna—there was a celebrity contingent present. At a table next to the stage, Anna Wintour watched the proceedings impassively while a gleeful Alan Alda clapped effusively. There were a lot of young people present , many of whom recorded the proceedings on their cell phones. You could order a cocktail. None of this would have mattered if the dancing and music-making hadn’t been as rousing as it was. Buck is both an exceptional dancer—his hovering balances and sinuous glides are exhilarating in their strangeness—and an affecting performer, responsive to his fellow artists and to the audience. In reaction to acclaim his eyes widen, a smile appears on his lips: “you like that?” At the same time, he’s deeply focussed. He listens intently to the music and shows it with his body. The music seems to set his molecules racing; his eyes gleam, his body practically vibrates with emotion. He is as responsive to Saint-Saëns or Bach as he is to jazz or Klezmer music. At Le Poisson Rouge, Woetzel described him as a “musical medium,” an odd phrase that felt strangely objectifying, but at the same time quite apt. 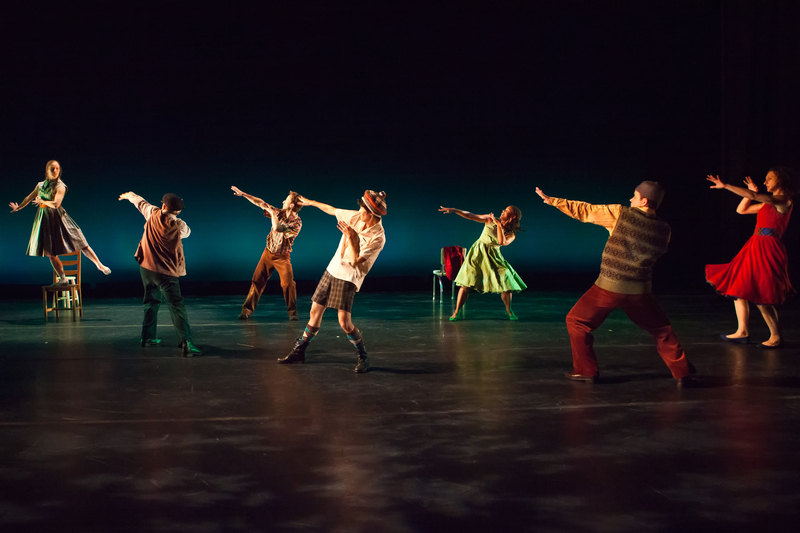 The Mark Morris Dance Group in “A Wooden Tree.” Photo by Tim Summers. In The Office, a group of seven (four women, three men) sit in a waiting room, awaiting their fate. Periodically, a stern woman in a boxy suit enters, clipboard in hand, and one of the dancers follows her into the wings. Their destination, whatever it is, is clearly not a welcome one. The characters’ reaction to the woman with the clipboard is one of anxiety, fatalism, stiff-lipped despair. 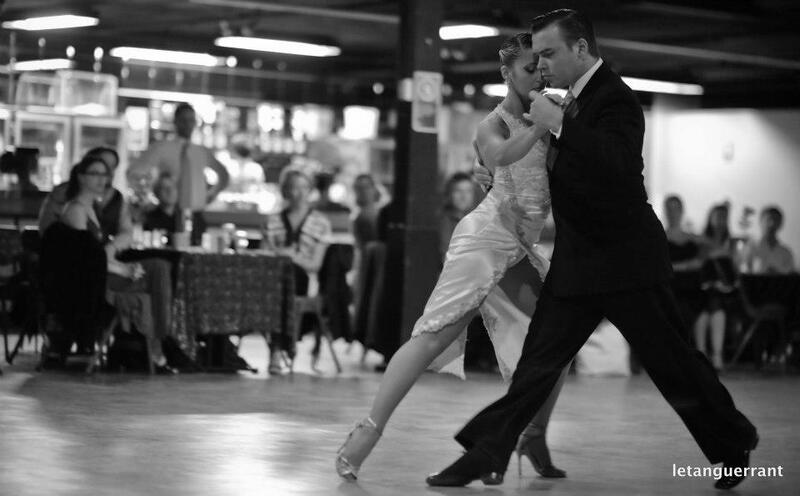 Meanwhile, between one exit and the next, they dance together in their frumpy clothes and clunky shoes: line dances and circle dances filled with jagged rhythms, stomping feet and clicking heels. At one point, two groups stamp out superimposed rhythmic lines. The dances have an almost Shaker-like simplicity. There are moments of joy: in one of the pieces, the dancers spin with arms outstretched, a movement that made me think of Fred Astaire. In another, they leap into a flying squat, then rise and kick their heels, as in a mazurka. The harmonium lends an eerie quality to the proceedings. By the end, only one dancer is left. Both The Office and the piece that follows, A Wooden Tree, are characterized by a striking simplicity. Morris’s movements seem obvious, but of course they’re not. Just try making a dance to this music and see how clever it looks. It’s precisely this simplicity, and Morris’s fidelity to the letter of the music (and even the lyrics, when there are lyrics), that drives many people crazy. How literal, how dumb. To the contrary, it is this utter spareness, this essential, utterly literal but profoundly personal response to the music that is Morris’s most unique, and compelling quality. Take it or leave it. Mikhail Baryshnikov—a friend of Morris’s—danced in A Wooden Tree as one of eight, all clad in Elizabeth Kurtzman’s dowdy Scottish getup. He has Morris’s quirky prosaic quality down completely. He doesn’t embellish or beautify the steps. In fact, he manages to look quite tired and defeated, not a bit like the soaring, boyish dancer we cannot help but remember whenever he enters a room. Morris is ruthless in this sense. All the characters in his Wooden Tree are lonely, awkward sad sacks, “sticking out their chests” (in Ivor Cutler’s words) and grasping at each other, rubbing up against their partners (of either gender) in a sad approximation of sexual coupling, or counting out 1-2-3 on their fingers like simpletons. In one song, Cutler recounts a car accident in clipped prose, as if in the voice of a child. The scene is depicted by Morris in straightforward, unsparing mime, repeated several times until Cutler’s voice hiccups emotionlessly, “Bill is dead.” One dancer’s body flops to the ground. Michelle Yard, who sits alone on a chair, buries her face in her hands. In “Little Black Buzzer,” Baryshnikov rests his head on a chair and taps out a message in Morse code, despondently. He might as well be tapping out a suicide note. Three (or is it four?) girls circle him, twitching awkwardly as Cutler spells out: “dit dit dat dat dat, dit dit, dat dat.” It’s funny and sad at the same time. Jenn and Spencer is an oddity for Morris, a dramatic pas de deux about a man and a woman, without jokes or ironizing or distancing of any kind. Its two elegantly-dressed lovers, danced by Jenn Weddel and Spencer Ramirez (whose names inspired the title) are locked in a kind of death struggle. The piece ends with a violent slap. Crosswalk, set to Carl Maria von Weber’s Grand Duo Concertant for Clarinet and Piano lies in more familiar Morris territory; it’s a large ensemble work displaying layers of dynamic, semi-balletic movement. One of its motifs is an eye-catching thumping pattern, executed on the heels with the dancers’ knees rocking in and out, arms dangling, head rolling. Another is an odd trio in which two women torment a man, tugging and pushing him to the ground; then the tables are turned, and it is the man who pulls the two women while they paw at their own thighs with claw-like hands. The gesture is ugly, animal-like and lends the piece a disquieting undertone. 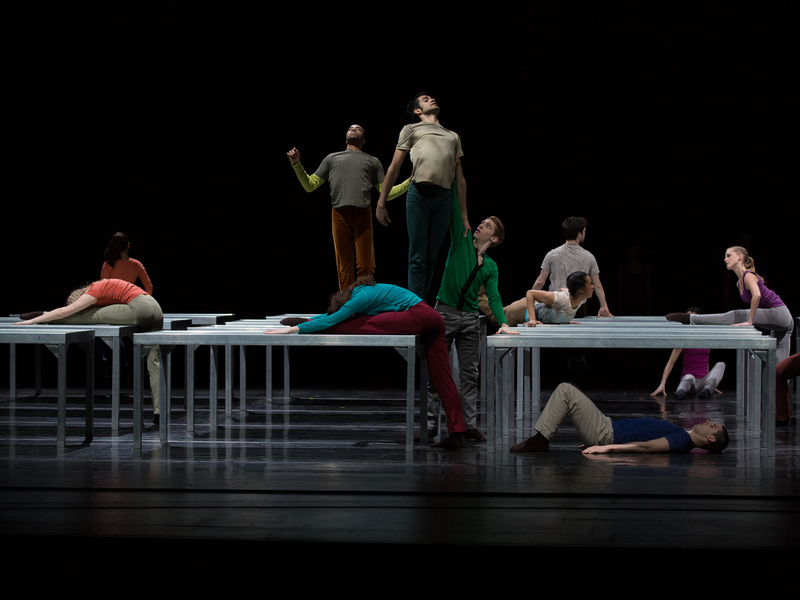 Juilliard Dance in William Forsythe’s “One Flat Thing, Reproduced.” Photo by Rosalie O’Connor. One of the most compelling performances of Martha Graham’s Appalachian Spring I’ve seen took place a few years back at the yearly showcase by the students of the Juilliard Dance program. No mannerisms, no stiff reverence, just a pure sense of discovery of Graham’s style and her great American themes of self-realization, possibility, hope. I make it a point to go back every year to see these soon-to-be professionals tackle new repertory. Of course, the results vary. This week, they performed Murray Louis’s Four Brubeck Pieces, Paul Taylor’s Sunset, and William Forsythe’s One Flat Thing, Reproduced. An ambitious program. The first two were accompanied by the Juilliard Jazz ensemble and the Juilliard Orchestra, respectively (the last has a recorded score by Thom Willens). The live music turned out to be one of the highlights of the evening, especially in Brubeck Pieces. The jazz players really sizzled, and it was marvelous to see how riveted the pianist, Mathis Picard, was by the dancers. He never took his eyes off of them, even as his hands skimmed the keyboard, head bobbing to the rhythms. Brubeck and Paul Desmond’s music is totally infectious. The dancing is athletic and bubbly and fun, and not terribly profound. It struck me how much more adult, and sophisticated, the music seemed in comparison. Even so, the dancers were totally in their element, and gave a full-bodied, joyful performance. Paul Taylor’s Sunset was more of a stretch. This strange, elegiac piece, set to Elgar’s Elegy for Strings, depicts a group of soldiers flirting with a flock of innocent, flirtatious young women in a park at day’s end. There is a heaviness in the air; the men are about to be shipped off to God-knows-where. The women may never see them again. Already, the men’s minds are elsewhere. They seem closer to each other than they will ever be to these clingy damsels in their white summer dresses. Midway, the music pauses and we hear, instead, the call of loons; the dancers move with almost ritualistic slowness, falling, rolling, resting their heads on each other. It’s a tender image but quite dark, because we realize, of course, that it is a foreshadowing of death. Some of these men will not return. When the soldiers depart, one of them drops his red beret. It’s a very beautiful work which requires an honest, unforced delivery, but also a vivid imagination. The Juilliard dancers seemed too fresh, as yet too carefree to really carry the weight of Taylor’s hidden message. Forsythe’s One Flat Thing would have also benefitted from a more knowing, less fresh-faced execution. The feel is jagged, loud, abrasive. To be effective, it has to be performed with a sharp-edged nervous energy. Twenty dancers drag an equal number of metal tables onto the stage, then push and fling their limbs and swing at each other, slapping legs, arms, and buttocks onto the tabletops, folding, falling, slicing the the air. It’s a complex work, with cues flying from one dancer to another, and echoes of shapes ricocheting around the space, groups forming and dissolving. It’s exciting, like watching an anthill on fire, at least, that is, until, bludgeoned by Thom Willens’ clanging score and the continuous frenzy of activity, the eyes start to glaze over. Analía Centurión and Gabriel Misse. Uncredited photo courtesy of Audrey Ross. Bijayini Satpathy and Surupa Sen of Nrityagram. Photo by Uma Dhanwatey. And then, as if all this weren’t enough, Nrityagram was in town. This Indian classical dance ensemble, specializing in Odissi (from Eastern India), is a regular visitor to our theatres, for which we can be thankful. Every performance reveals new aspects of the dancers’ artistry. This particular program, presented under the auspices of the World Music Institute, was especially intriguing because it featured the dancing of just two performers: Surupa Sen (choreographer and artistic director) and her senior dancer Bijayini Satpathy. They were accompanied by an extraordinary quartet of musicians: flute, percussion, violin, and harmonium. The harmonium-player also sang in a sweet, melodious voice that reminded me of Caetano Veloso. The program’s title, Samyoga, means “union” or “synthesis’ in Sanskrit, and in a way the evening was a tribute to a great artistic partnership. 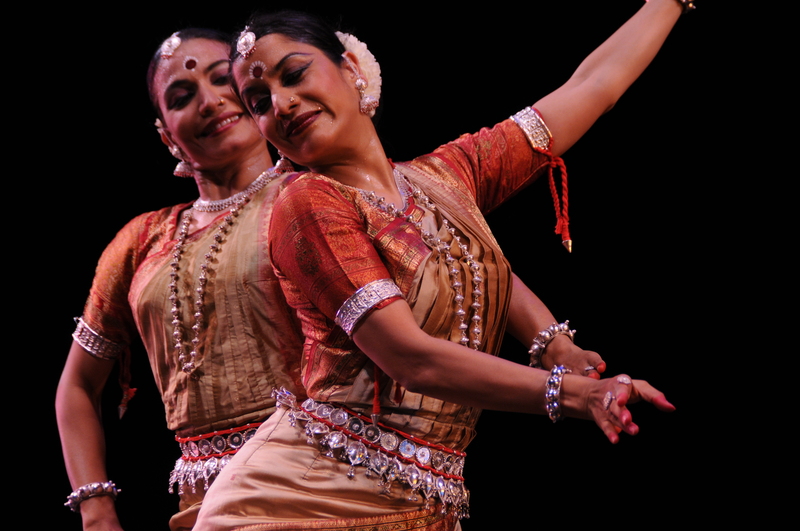 Sen and Satpathy have danced, taught, and lived together for twenty years at the Nrityagram dance village and school, created in 1990 by the late Odissi dancer Protima Gauri. Most of the program consisted of duets in which the two women moved together, almost like two halves of the same being. Introduced by a bewitching flute melody, the two entered with a lilting walk, one behind the other, ankle bells trembling. They were like two bodies moving with one breath. Their physical resemblance is striking: compact, round-shouldered, slender-waisted. But as the evening developed, differences were revealed: Sen has a larger jump, and is more forceful. Satpathy is slightly more limber, with long arms and an ability to change qualities with startling speed. She also has one of the most vivid, mobile faces I’ve ever seen, with eyes that could read across miles on a foggy day. Sameness and difference, oneness and separation. These were the themes of the evening. The sophistication of Sen’s choreography lies in its clarity and abstraction. The two dancers trace elegant patterns in space, moving toward and away from each other in a way that feels both organic and universal. At the same time Sen manages to reveal what is most beautiful in each dancer, and then to contrast these qualities with passages of unison and counterpoint. Developing the theme of unity, she has created a series of combined poses for the two women, perfectly balanced compositions one might see rendered on a temple wall or in a Mughal miniature. In one, Satpathy embraces Sen from behind, their arms intertwining, the tips of their fingers barely touching—a position strikingly similar to the final image Balanchine’s pas de deux from Symphony in Three Movements. The range of emotions they depict is also remarkable: friendship, romantic love, eroticism, anger, displeasure, surrender. Carried along by the mellifluous sounds of the flute and the sharp, chirping rhythms of the mardala drum, Sen and Satpathy created a universe. Than, you, Mindy Aloff, for this wonderfully detailed, and vivid account.